The one thing that’s been on my calendar of things to do this month is to go mountain biking with Luke. 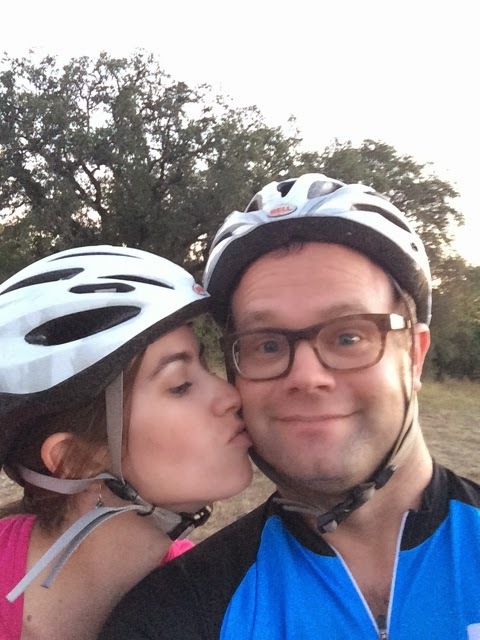 I’ve managed to do everything else with all my other friends, so I figured I needed to join in on what my actual best friend loves, which is mountain biking. It was kind of hysterical though. 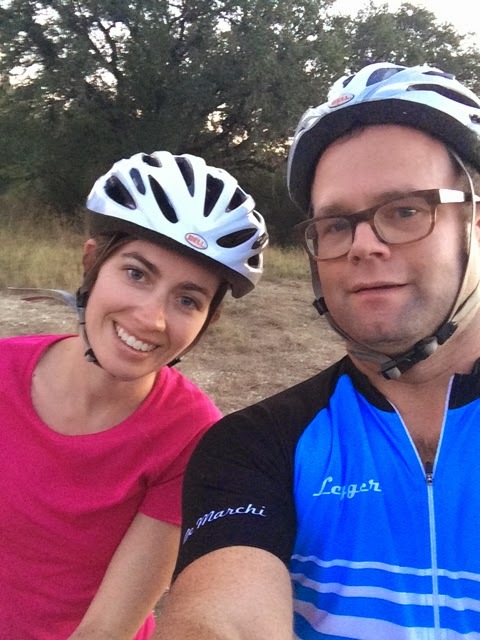 First he brought out some mountain bikes (people, we have way too many bikes in our garage, because we are Newtons and Newtons do bikes, thanks to all the brothers who have worked in and managed a bike shop in College Station and now are almost pro mountain bikers). 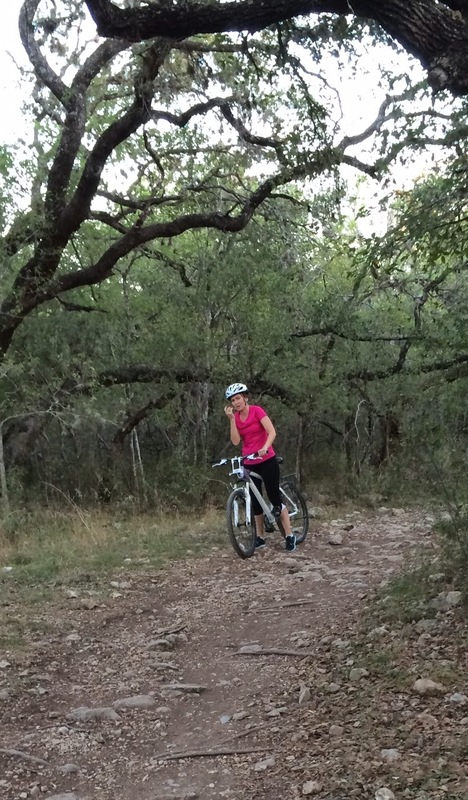 Oh my goodness–trying to get on a mountain bike was like learning to ride a bike all over again. I was freaking out, and this was just on the sidewalk in front of my house. Yeh, I’m kind of a baby when it comes to stuff like this. 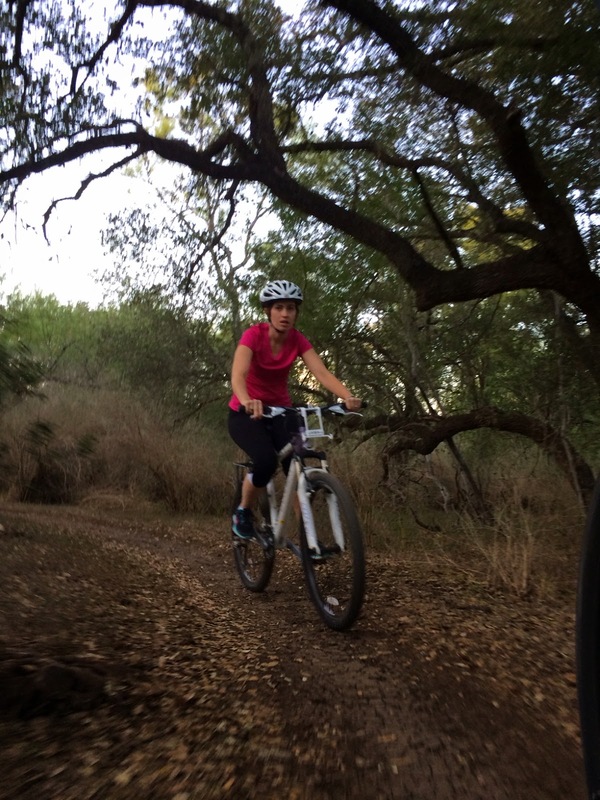 Amaleah, who doesn’t have a fearful bone in her body, finally brought out her mountain bike for me to try, and after she did a demonstration, I was able to handle it a tad better. At least the bar in the middle didn’t seem like it was going to injure my womanhood for the rest of my life, unlike Luke’s manly bike. Just saying. We dropped our kids off at Sarah’s (yes, same Sarah, she has a way of popping up in this blog, doesn’t she? 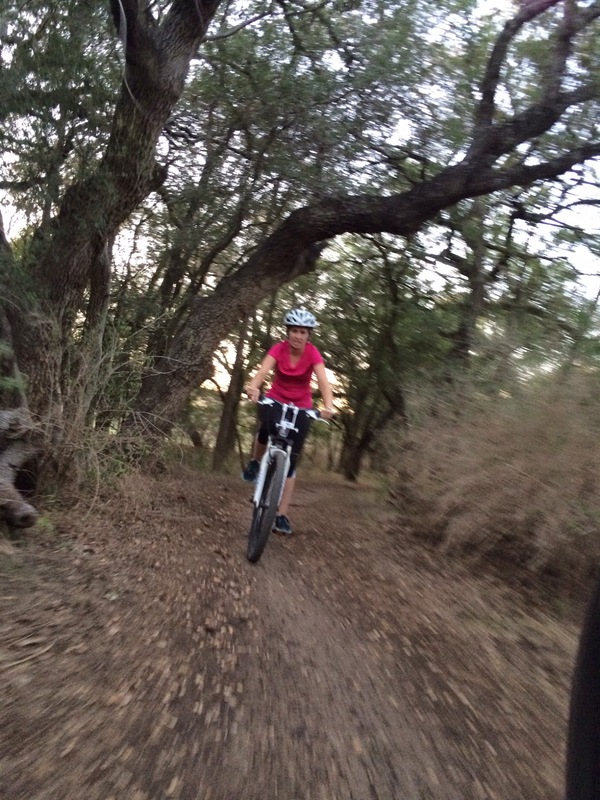 ), and she pulled out her girly mountain bike for me, complete with a basket in the front. And an extra cushiony seat that also doubled as a trunk. Luke kind of rolled his eyes at all this. 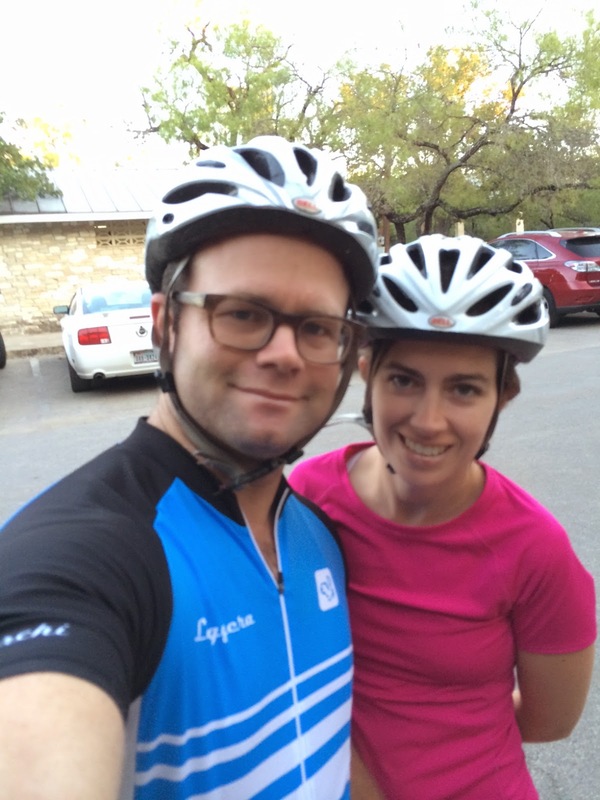 She even sent me with a matching helmet to spite Luke (who needs to come out of his comfort zone by not being embarrassed at this kind of thing), but the straps got all twisted and I had already wasted half of our evening learning to ride a bike again and crying. Not really the crying part. So I just wore my tried and true helmet. So we got there and I kept wasting time trying to decide whether or not to wear my sunglasses, meanwhile the sun kept setting. Let’s just say my husband is very patient. Finally, I sucked it up and we started riding. And seriously, I kept yelling things like, “Why did you make me do this?” and “I hold you personally responsible if anything happens to me” (to which he responded “I hold your blog personally responsible”). I just couldn’t for the life of me see how it was fun going bumpity bump all over the rocky path for miles. And as if to mock me, Luke kept pulling out his phone and taking selfies of us, and probably checking his email and sending a few, that’s how fast we were going. We did get to see quite a few deer and bunny rabbits, so that was nice. He had me slow down here and there to watch him do a few crazy stunts. Thanks honey. Now I can freak out even more when he takes Amaleah mountain biking. Those two make a great team. Alas, I made it, and I didn’t even fall off once–just a few minor slow downs where I had to get off and walk just a bit, but no crashes. By the end I was definitely getting used to the whole thing, but when my kids asked me if liked it I was like, “I wouldn’t really say that.” But I think I got Luke’s hope up for a wife-y partner because late last night he kept showing me craigslist mountain bikes for sale and mentioning Christmas and stuff. I just rolled my eyes back at him. I did it, but I’m not promising to ever do it again. At least on a roller coaster you’re strapped in and nothing you do changes the outcome. On a bike, one wrong move and you’re a goner. At least that’s how I felt the whole time last night. And I’ve got the tensed sore muscles today to prove it.